Elvis slots come and go, and just as the King retains a huge fan base long after his death, so do Elvis-related slots. 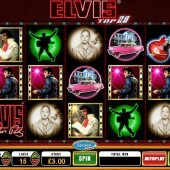 Online slot developer IGT have been busy on the Elvis front, with several Elvis-themed slots of varying quality on offer at online casinos, but Barcrest (IGT-owned) haven't been left out of the loop - their own Elvis: Top 20 slot looks to get a little more action for the discerning slots player. But does it deserve its place in the Top 20 or is it slipping quietly out of the charts altogether? A 5 reel, 20 pay-line slot, with bets starting at $0.05, the game also comes with bonus games and a progressive jackpot. Barcrest have gone to town in the graphics side of things. Here you'll find plenty of photorealistic images of Elvis in his prime, from black n' white high school Elvis, to '60s black leather jacket Elvis, and further on to '70s jumpsuit n' double-chin Elvis. Gold discs, neon signs, guitars, jukeboxes and Cadillacs make up the reels. There's also a nice authentic one-armed bandit sound as you spin the reels, and plenty of guitar riffs to help you along. The gold crown symbol acts as the Wild, and substitutes for every symbol other than the bonus symbols, of which there are many. Look out for the jukebox, guitar and gold disc symbols, as they are your path to gold and glory. First up is the Jukebox Scatter Bonus. Simply get three or more jukebox symbols across the reels and you'll be taken to a bonus game where you must choose a jukebox to reveal a prize. Look for the highlighted multiplier as the bigger the multiplier, the more you'll win. The next up is the Guitar Scatter Bonus. As with the jukeboxes, three or more guitar symbols on the reels trigger a bonus game where various guitars on-screen will award varying degrees of cash rewards. Finally, three or more gold disc symbols triggers a 'wheel of fortune' style game, where a spinning wheel gradually slows to a stop to reveal a prize in the shape of a multiplier. For an authentic Elvis experience, together with some nice bonus touches, Elvis: Top 20 is hard to beat. 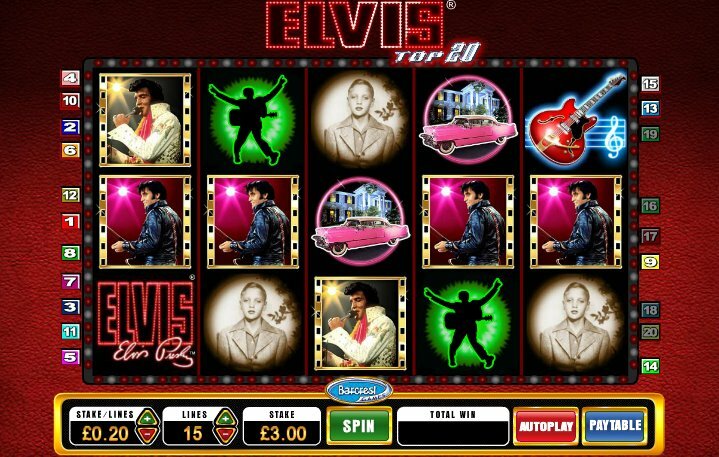 If you're after more action, I recommend IGT's Elvis-themed slot, Elvis: A Little More Action, although it's fairly light on the ground if you're after free spins and the like. IGT's other take on the Elvis mythos, Elvis: The King, is also worth checking out.